Quintessential Waterfront Seasonal Camp. A full modern kitchen, panoramic water views, 3 bedrooms, fully furnished. Propane Heat. Screen deck/porch. Campfire pit at the water's edge. A dock, float. Swim float. 1 bath, shower, washer/dryer. An outdoor shower. Great Fishing right from the dock. Kayaking, Canoe, swimming. Outdoor grill. Private driveway. Great walks, hikes, along the beautiful road trails. Life long believer in the pleasure of Seasonal Lakeside Camp living in Maine. 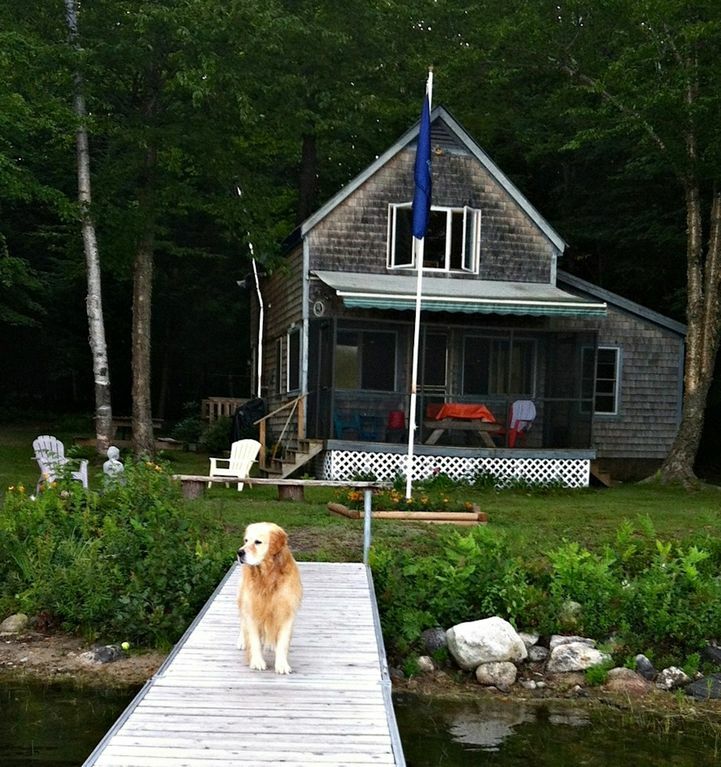 Living lakeside, on a quiet waterfront in the Maine Woods is a life reward for me. Everyday living on the water's edge is a 'good day'. Thank you for 'viewing', my property. A wonderful, open, comfortable, casual, living space inside the camp. Great water views looking out. When you are sitting on the float at the end of the dock or sitting next to the campfire, or on the screen deck under the canopy, life at Barker Pond can make you feel like, 'time stands still'. And you just enjoy the nature, the water, the views,, and the casual, comfortable camp living. If you like 'getting away from it all', and having a private waterfront stay in the 'middle of the Maine woods'? This is your place. Your surrounded by trees and water and your neighbor's if around can only be seen when looking through the trees across the property. My camp is on an acre of land. 1 bath, indoor shower, washer/dryer. And also an outdoor shower. Very Private remote living on the water's edge, 2 miles into the woods, along a beautiful, scenic single lane camp road. It's a road that was many years ago a working Railroad. Views of the water from 2 bedrooms, the porch. Dining and living area. Vacationing on the water's edge. Panoramic water views from the dock and yard. Beautiful water views and views of the foot hills of the White Mountains. Vacationing on the water's edge. A land line. - Local calls only. Or folks can call into the camp. Or you need to provide a calling card for outgoing calls. Guests provide their own sheets. Host supplies blankets and pillows. Basic Internet - via the Phone Land Line. If you have a favorite towel, please bring it. There are towels for use as the camp as well. No cable or satellite - 8 channels - NBC, CBS, ABC and 5 other channels. Come relax, be comfortable, and listen to the Loons and the wildlife. Watch the Bald Eagle, the Blue Heron, and many more scenes and views of Nature. Sit outside on the dock and float on top of the water. Fish until your hearts content. Swim, Kayak, or Float out to the "Swim Float.' Have a campfire in the front yard on the water's edge, day or night. And if you stay at the camp during a 'full moon', watch the moon rising and reflection across the water. This is an amazing camp. It has all of the comforts, including a wonderful kitchen and an outdoor shower, for a fabulous, restful adult stay in Maine. This was our second time visiting and again it did not disappoint. The owner has gone out of his way to make this the perfect spot. The loons are fantastically noisy. We were greeted upon arrival by the cabin’s owner and his trusty sidekick Jack. Mark Ford was friendly and courteous. Everything was explained to us and he also had paperwork available about the cabin and surrounding area. Menus were available for restaurants but we cooked over the campfire for our “Maine” experience. Beautiful,comfortable cabin and a dock area that could be on a postcard. I would highly recommend this property for a quiet and private vacation. What a great place to get away from it all and truly relax. Cabin has everything you need. Pond is beautiful and quiet, great for kayaking. Near by towns have good food and great little shops. We spent a week at Marks cabin in the woods. It is such a beautiful spot in the woods on the water away from it all. We Thoroughly enjoyed every minute. We spent hours in the kayaks exploring. We made it up ther river to Middle pond a few times enjoying all the dragonflies, turtles, birds and a few blue herons. We even spotted one of the beavers. On the road to the camp we saw a deer and a family of owls. (Such a treat!). During the week we kayaked on the Saco and rented a boat on Lake Sebago. Mark was so helpful with all our questions and the cabin was immaculate with everything we needed. I would highly recommend staying at Marks cabin and the words, it is truly a slice of heaven ! Mark and Jack met us at their camp at check in and showed us around. We fell in love with the camp at first sight! We spent a glorious, relaxing and fun filled week kayaking, swimming, paddle boarding and reading. The kitchen is equipped with everything you could need and the cabin could not be more accomodating. Our dog, Yogi Bear, was in heaven, we hope to be back for another stay, Thank you Mark and Jack for a fabulous place to vacation. This Seasonal Maine Camp is located on a very private, peaceful, waterfront scenic view location. It's secluded, beautiful, panoramic views. Great fishing, great swimming, kayaking. Have a big camp fire, barbecue, relax lakeside, and enjoy the tranquility of Barker Pond.